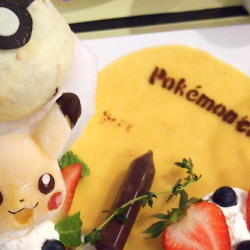 Till 19 Feb 2017 Pokemon Cafe: Enjoy 10% OFF Dining & Merchandise Before It Closes on 19 Feb! Before the cutest pop-up Pokemon Café bids farewell on 19th Feb, they would like to say a big THANK YOU to all of you! As a gesture of appreciation, all customers can enjoy a 10% discount on cafe dining bill and Original Merchandise! 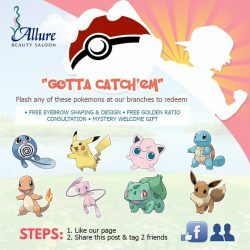 Simply show your ‘like’ on this FB post at the Pokémon cafe cashier counter! 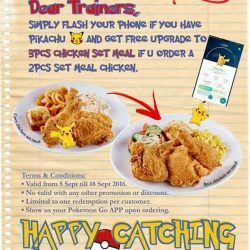 Gotta catch Pokémon Cafe Singapore at Bugis Junction, #04-05 before it escapes! 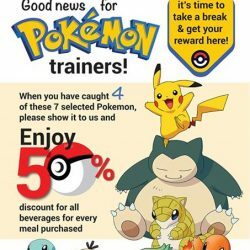 Attention Trainers! We hear Lickitung’s the newest ice-cream fan in town! 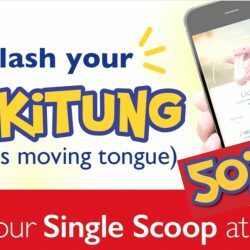 Flash your Lickitung(with its moving tongue) these 2 days and get a Single Scoop of Ice Cream at 50% off at Swensen's! 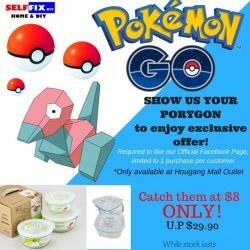 Selffix DIY: Show your Porygon and you may purchase Homio Glassware at $8.00 instead of the usual $29.90! 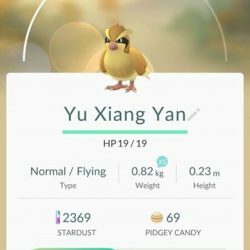 Proud of your rare Pokemon? Show us your Porygon and you may purchase Homio Glassware at $8.00 instead of the usual $29.90! What are you waiting for? Catch'em all! Pssst, have you caught any of these pretty-in-pink Pokemon? 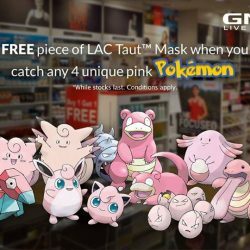 Present 4 unique pink Pokemon to our staff in stores to receive a FREE LAC Taut Collagen Mask + GNC VIP membership. 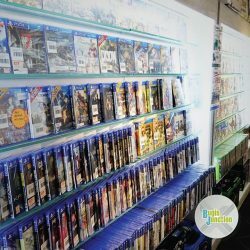 Limited to 1 redemption per customer till 18 Sep 2016, while stocks last. Other conditions apply. 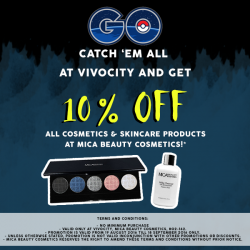 Present a screenshot of a Pokemon caught at VivoCity and receive 10% discount at Mica Beauty Cosmetics! T&Cs apply. 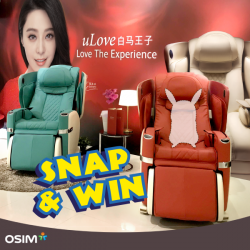 Promotion is valid from 19 August to 18 September 2016 at VivoCity, #02-162 and we are open from Monday to Sunday, 10am to 10pm. Hey Pokemon trainers! Have you caught Poliwhirl? Pikachu? Jiggly Puff? Or any of these: Squirtle, Charmander, Mew, Bulbasaur and Eevee? If yes, then flash any of them at our branch and redeem! 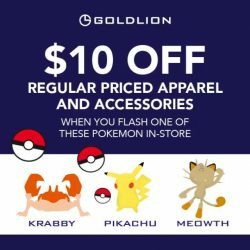 Haven’t had enough of Pokémon GO? Fear not, as we bring back the lures and power up the rewards! From 26 Aug to 30 Sep, receive a $5 City Square Mall voucher, $5 TimeZone Powercard and $1 Golden Village movie discount voucher with a min. spend of $50* and a screenshot of a Pokémon caught within City Square Mall! 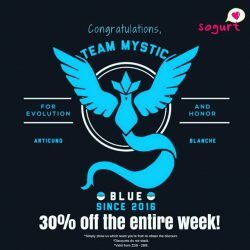 Only for the 1st 400 Pokémon Trainers! 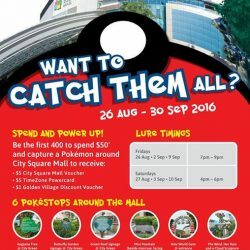 So hurry, come on down to City Square Mall and catch them all. 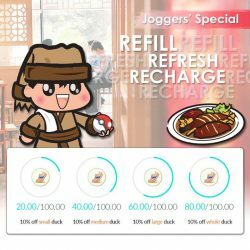 Hungry & thirsty from Pokémon hunting? It’s time to take a break & get your reward here! 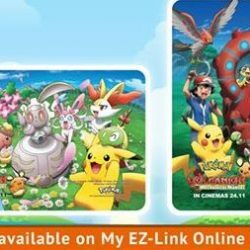 Hey Pokemon-Go maniacs out there! 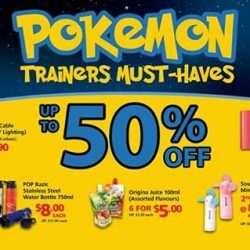 If you are at least a level 10 Pokémon trainer, head over to GameMartz at Bugis Junction (#03-24B) and flash your trainer profile to get a FREE Pokémon Strategy guide! What’s more, receive 5% off* on any purchase of software or accessories! 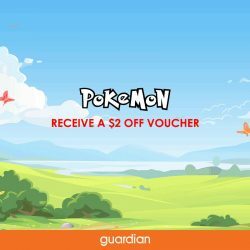 Receive a $2 OFF Voucher when you catch an Orange Pokémon* and show it to the staff at Guardian stores at VivoCity, NEX and Jurong Point Mall! 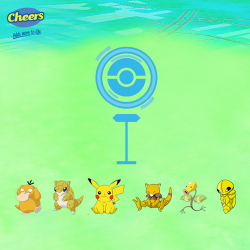 Hurry catch 'em all! Calling all Trainers at Westgate! Need a good rest and something sweet to appease your taste-buds after a tiring day of hunting, school or work? 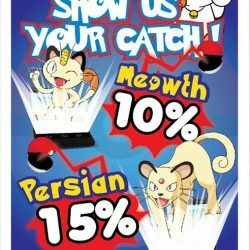 Come down now to Ge!ato @ Westgate to catch them all while enjoying our tasty and soothing Gelato! Our location is right at the Gym and surrounded by Pokestops! 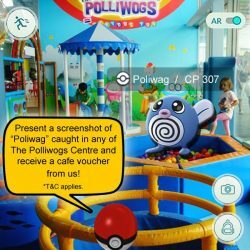 From now till further notice, take a screenshot of either Kakuna, Venonat, Pidgeot or Paras being caught with our stall in the background, like us post it in our Facebook wall! 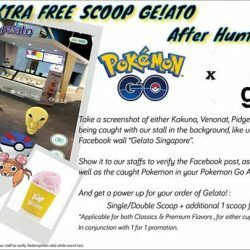 Show it to our staff to verify the post as well as the caught Pokemon in your Pokemon Go App (Yup, you have to catch them) to get a free scoop of Gelato for every purchase! This is applicable for both classics and premium flavors, for either cups or cones and is in conjunction with our 1 for 1 promotion! So come down now and hunt with your taste-buds satisfied! Till 30 Sep 2016 Teo Heng KTV Studio: Enjoy 1 Hour FREE KTV when you show your Jigglypuff! Even Pokemon trainers need to relax! 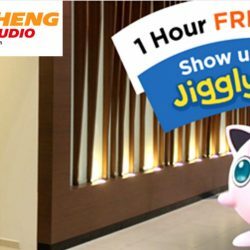 Enjoy 1 hour of FREE KTV at Teo Heng KTV Studio for every 3 hours of booking when you show them your Jigglypuff! Offer is valid from now till 30th September, from Monday to Thursday. 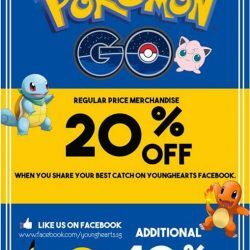 Simply flash your screenshot & "like" on Young Hearts fb to any of our Young Hearts Singapore boutiques to enjoy this great offer! Calling all PokemonGo masters - we've got great news to chase away the Monday Blues! 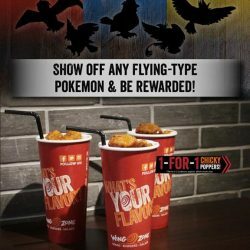 Catch any species of bird Pokemon and enjoy 1-for-1 Chicky Poppers here at Wing Zone! This offer is limited to 50 redemptions per outlet daily, so hurry!